Lent by the Sir Alan Barlow Collection Trust. 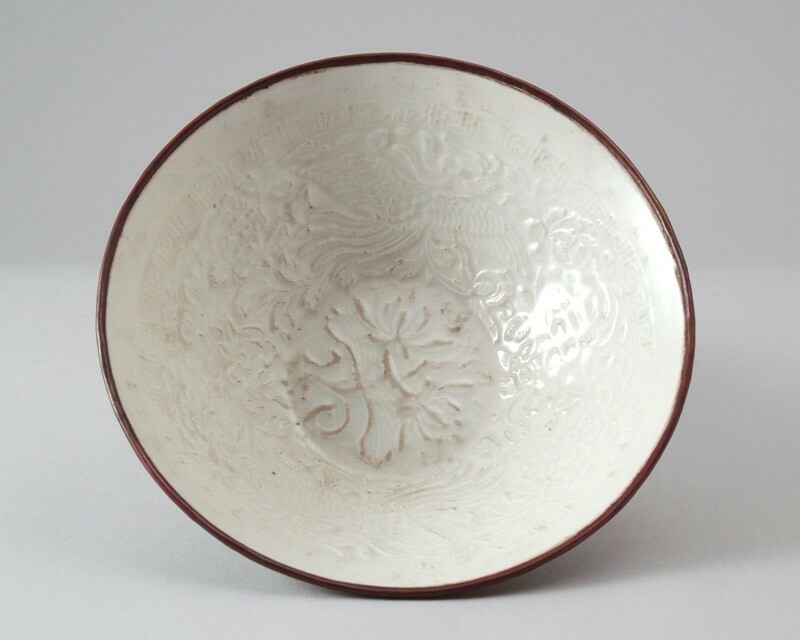 The wide conical bowl has slightly rounded sides, a flat centre and a very low foot. The inside is moulded in relief with a central lotus spray with two blooms and a leaf, the sides show a pair of phoenixes between dense peonies, and a key-fret border below a plain band at the rim. The outside is plain. The somewhat opaque milky glaze has a bluish tinge and has degraded on some of the relief areas. It fully covers the piece, but the rim was left unglazed and is bound in a copper band, since the piece was fired upside down.